The 6th International Forum on Timber Architecture and Construction will offer a conference programme with first-rate international speakers. 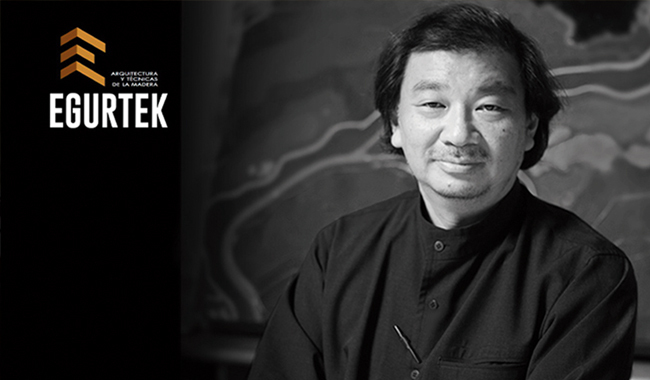 Japanese born Shigeru Ban, Pritzker Prize 2014, has confirmed his participation at Egurtek, 6th International Forum on Timber Architecture and Construction which will be held at Bilbao Exhibition Centre on 20 and 21 October. Shigeru Ban has acquired international recognition for his high quality yet low cost designs using materials such as timber for those who are most in need, such as refugees and victims of natural disasters in Rwanda, Turkey, India, China, Italy, Haiti, and Japan, among other countries. His global career can be defined as twofold in which public and private buildings and voluntary architectural solutions in response to humanitarian problems are equally striking. The experts highlight his innovative vision towards unconventional structures and materials, his strong commitment and sensitivity, his pioneering work in the field of sustainability and recycling, his construction excellence, and his constant ingenuity and innovation. Furthermore, Egurtek 2016 already boasts an extensive programme of talks in which other distinguished professionals from the world of architecture will participate, such as Michael Green from Canada, advocate of the need to use timber in the construction of large scale buildings. Speakers such as Anssi Lassila, from Helsinki, an architect who seeks balance between urban and rural life and who completed Puukuokka in 2014, the first eight-storey apartment block mad out of timber in Finland, and Mónica Rivera and Emiliano López, who look for specific responses to the reality of each project, highlighting the value of everyday life, discreet intervention based on the environment and construction clarity are also expected to participate. The Rumanian architect, Tudor Radulescu will explain his experience in the Church of the Barefoot Carmelite Order in Snagov, where he has built a magnificent arch that covers the building and rests on 12 mighty pillars. Juri Troy from Austria will reveal his spectacular work known as “House under the Oaks”, a wooden box resting on six columns with a minimum ecological footprint. On the national scene, the presence of speakers such as Fernando Tabuenca and Fermín Leache, winners of the Egurtek Construction Award 2014 for their “Condestable House”, can be highlighted. The architect from Vitoria, Gorka Elorza, interested in eco-architecture, innovation and sustainability, rehabilitation and accessibility in his work, as exemplified by the detached family house that he designed in Guadalix de la Sierra in Madrid, will also transmit an analysis of his experiences. The final speaker is the Catalan architect, Jordi Fargas, who designed a “passive house” in 2011 based on prefabricated wooden components to minimise construction time and energy consumption. Egurtek 2016 will also include a programme of workshops with sessions on “Thermoformable materials, other joinery options”, “Study of the performance of wooden construction materials and systems”, “Passivhaus Construction in the Basque Country”, “The influence of the world timber market in the south of Europe”, “Research projects in woods in the Basque Country” or “Bioeconomy in the South of Europe”, among others, and an exhibition area in which around 40 firms will be present.